The Sanderson is a family run Platinum Holiday Home set at the famous Camber Sands beach with 7 miles of golden sand. 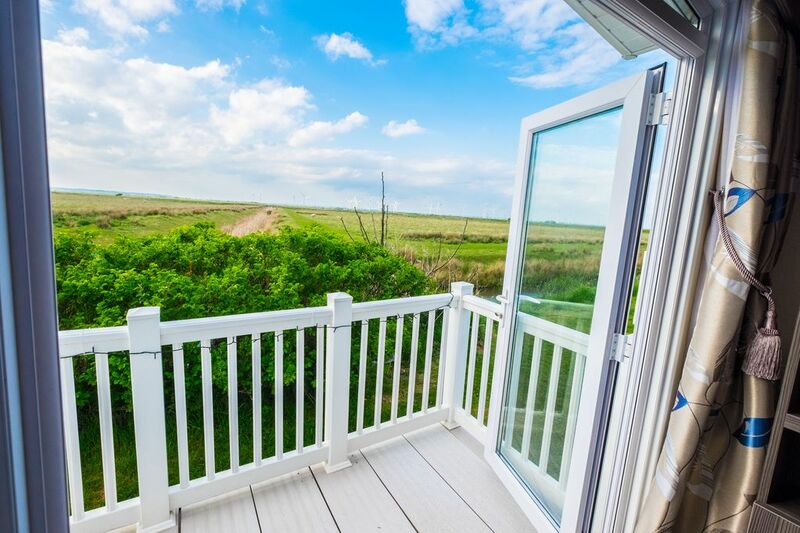 With all the modern amenities our contemporary accommodation will allow you to relax and unwind with views across rivers and fields or 5 minutes walk to the beach with plenty of activities in the area to keep you entertained. We are situated in one of the most sought after parts of the park with stunning views across the river and fields where you can watch the sun go down but also only 2 minutes walk to the Entertainment Complex, Restaurants and Shops. For full details see below. There is plenty of parking directly by the property and further parking close by. *Please note the evening Showbar Entertainment and unlimited swimming is planned to start from February Half Term 2018 through to the end of November at a small additional charge directly with the Park. The exact season start and end is not guaranteed if you are booking early or late in the season. Please check the dates and schedule before you book. Please note that in peak season change over days are Mondays and Fridays to adhere to the parks schedule. Outside of these times this is not enforced. Camber Breaks is a family run business started in 2017. Having had a few holidays ourselves we wanted to make sure that any guests that come and stay have the best time possible and don't have to worry about what they will turn up to. We take pride in the experience and quality we offer as our guests are the ones that allow us to have the holiday home where we also enjoy some amazing times together. The park has wifi available from Wifinity to holiday makers from as little as £3.95 although coverage does vary across the park. *Please note the evening Showbar Entertainment and unlimited swimming starts from February Half Term 2019 through to the start of November at a small additional charge. The exact season start and end is not guaranteed if you are booking early or late in the season. Please check the dates and schedule before you book. 2019 prices are as follows 9th Feb -22nd April - £59 per week or £40 for a short break 26th May -1st September - £59 per week or £40 for a short break All other times - £44 per week or £30 for a short break The passes can be provided to our guests a the same price as park as we get them and leave them in the property for you to save you having to queue at reception. If you would like us to provide these please message. Please note in peak times we require Monday and Friday check in days to stay in line with park schedules. Thank you to Ross and Family for the rental of your beautiful, clean caravan, which looks just like the photos my children loved sitting on the nice ratten furniture on the decking watching the sheep,swans and rabbits. Ross went out of his way to make our holiday run smoothly from the day we booked until the last day of our holiday. He always awnserd our messages straight away. Thank you for being so friendly and supportive and checking in with us to make sure everything was ok during our stay. We will deffinatley be reccomending you to all our family and friends and we will be booking again with you in the future. If you are looking at renting this caravan, book it, you wont be disappointed!! Ross was very helpful, giving excellent information for our holiday, always replied quickly and very informatively. We visited this beautiful caravan for 4 nights in early July. It was exactly as shown in the photos and could not have been cleaner or better presented. The bed was so comfortable and the furnishings top class. It was in the best area of this busy park, we were only a 2 minutes walk to the entertainment centre and yet it was completely quiet and very private. The double patio doors opened out onto our decking and the uninterrupted view of fields, a stream, sheep and swans. We watched some lovely sunsets. Parking was immediately opposite and we always got the same space. You can take from the park what you want. There are many things to do there if you wish. We were after a quiet break so we only went to the evening entertainment once, where we enjoyed a quiz hosted by the TV star of The Chase and a lively rock show by the young troupers. We enjoyed walks on the miles of beach, a trip to Dungeness with a ride on a steam train and a visit to amazing Great Dixter gardens. Dealing with the owner was so easy and he always answered any queries promptly. As we had travelled all the way from Cheshire, he even managed to arrange early access for us.